David Fizdale is actively supporting civil rights leaders and causes in Memphis. It would have been easy for Grizzlies coach David Fizdale to stay silent. But Fizdale didn’t stick to sports. He’s a basketball coach, in his first year in Memphis, a city with a tortured racial history, culminating in the assassination of Martin Luther King, Jr., at the Lorraine Motel on April 4, 1968. (The motel is now the site of the National Civil Rights Museum.) But King’s murder was not the beginning of Black Memphis’ anguish; it was simply the most public manifestation of horrors more than a century in the making, dating back to race-fueled riots in the city in 1868 that ultimately claimed both black and white lives, and through an explosive response to the growing influence of a burgeoning black middle class in the city early in the 20th century. So Fizdale spoke out, and continues to speak out, against the presence of two statues in the city -- of former Confederate president Jefferson Davis and of Nathan Bedford Forrest, who amassed a personal fortune in the slave trade before the Civil War before becoming a general in the Confederate army, an early scion of post-Civil War Memphis and one of the first members of the Ku Klux Klan, rising to a position of authority in that odious organization. I’m not even saying tear them up and melt them down. Put them in their proper context in history. Their proper context is in a civil rights museum, where you could put them in context and talk about how awful they were. And Fizdale has lent his name to the call, years in the making by many residents in the city, in the midst of a national reexamining of the presence of such statues in other cities -- including Charlottesville, Va. -- that the statues be removed from their current respective places near downtown Memphis. “My agenda is simple -- I want those things out of our city, out of public view,” Fizdale said by phone Saturday. 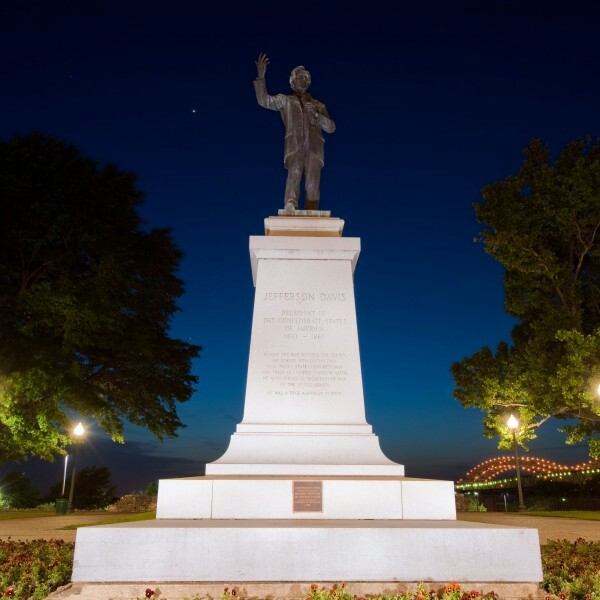 The Davis statue, built in 1964, is in what is now known as Mississippi River Park, near the popular tourist attraction Mud Island. The park was renamed in 2013. It used to be called Jefferson Davis Park. Protesters surround the Jefferson Davis Confederate statue at Memphis Park on Aug. 15. The Forrest statue, built in 1905, is in what is now known as Health Services Park; Forrest’s remains, along with his wife’s, are interned there. This park was also renamed in 2013; it used to be called Forrest Park. More than 4,500 people signed petitions last month, at the behest of a local advocacy group known as Take Em Down 901, demanding the immediate removal of the respective statues. The petitions were delivered to the Memphis City Council. The Council has already voted once, in 2015, to remove the statues, but that vote was symbolic; it does not have the authority to do so. However, public sentiment seems to be coalescing toward removing the statues. The Greater Memphis Chamber of Commerce announced last month it would support removal, and Memphis Mayor Jim Strickland is also in favor, though he does not support Take Em Down 901’s demands that the city remove the statues immediately. The Memphis City Council will vote Tuesday on whether to approve removal of the statues. If it votes to approve, it will have to seek a waiver from the Historical Commission, which is set to meet again in October. However, the Commission may not actually vote on the question of removal until next year. The Historical Commission rejected the Council’s vote to remove the statues in 2015, keeping the statues in their current places. Fizdale first spoke out to Wendi Thomas, a former columnist with the Memphis Commercial Appeal, who launched MLK50: Justice Through Journalism -- an online journalism project about economic inequality in the city -- last April. In a video published on the website last month, Fizdale made his feelings plain about the Davis and Forrest statues. And Fizdale singled out Memphis’ white population to stand up and join his campaign. Natasha Fizdale had already jumped into community activism, hosting the Girls’ Summit at FedEx Forum last April, inviting 300 middle and high school girls to meet stars like future Hall of Famer Tina Thompson -- a childhood friend of David Fizdale -- along with Swin Cash and Allison Feaster, along with 1996 Olympic gold medal winner Rochelle Stevens, a Memphis resident. The two-day summit was timed to coincide with the 45th anniversary of the passage of Title IX. Fizdale came to know about the statues soon after he took the Grizzlies’ job last year. After Charlottesville, where Nazis and other white sympathizers marched through the streets of that city to protest the planned removal of a Robert E. Lee statue -- and where an alleged neo-Nazi was charged with the second-degree murder of Heather Heyer, a counter-demonstrater, by running her over with his car -- Fizdale wanted to speak out about the Davis and Forrest statues in Memphis. Fizdale’s stance on the statues comes from even deeper roots than you’d figure at first glance -- his father was white, and Fizdale’s white grandparents met during World War II. I want people to be uncomfortable. Our owner (Robert Pera), the owner of FedEx, our white owners of all the companies in the city, they’re the ones who have to step up and clean this out of our city. Money talks. No one from the team has asked Fizdale to tone it down. Everyone, of course, does not agree with his stance in Memphis. But the neighborhoods have a different view. To the “whataboutists” -- those who sometimes reflexively ask, ‘what about black on black crime? What about Chicago? What are you doing about that?’ -- Fizdale takes umbrage. His maternal grandfather, Robert Hamilton, a deacon in his church in South Central L.A., where Fizdale grew up, who’d lived there for decades, was murdered in 1993 by black kids who robbed him in front of his house, and shot him after he refused to let them in; his daughter, her husband and their kids were still inside. And Fizdale lost more than a few other friends and acquaintances to gun violence growing up. To that end, he has started working with Urban Farms Memphis, a part of the Memphis Tilth program that seeks to create access to sustainable healthy foods grown locally, through student and volunteer engagement, to help reduce the levels of obesity, diabetes and other maladies that plague communities of color and low-income areas. He knows that some -- many -- may disagree with his view about the statues. But he will not back up once the season starts. More Morning Tip: East mostly unchanged after mega-trade | My summer reading list | Mailbag: Can Cavs top Warriors?